The full-featured, full sized City Mini ZIP is our smallest folding stroller. It doesn’t just fold in half from top to bottom, it folds in from the sides, which means our one-hand 3D fold action will fold the City Mini ZIP down to 1/8th the volume of the open stroller. So it fits in the smallest of places and makes traveling a breeze. The City Mini ZIP is not intended for jogging. Available exclusively at buy buy BABY. Welcome to the Fold™ - With the push of a button and the pull of a strap, the City Mini ZIP folds three-dimensionally making this the most compact Baby Jogger fold yet - still using just one hand! It even stands while folded. Canopy - Our large UV 50+ canopy can adjust to multiple positions and will throw a lot of shade on a sunny day. Cup Holder - A convenient cup holder is included on the City Mini ZIP to keep your baby’s bottle or your own beverage close at hand. Wheels - You can set your 5.5” lightweight front wheels to swivel for your daily obstacle course or lock for long distance strolling. 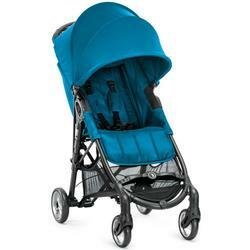 The front wheel suspension provides a smooth ride for your baby. Travel System - The City Mini ZIP can become a travel system in a heartbeat using a Car Seat Adapter (coming Fall 2014). Simply snap on the brackets and youve got a customized travel system for your infant. (Car seat and car seat adapter sold separately).